Perhaps it was the sun shining through the Victorian roof of Olympia’s Grand Hall, maybe at the second time of asking both visitors and exhibitors have got to terms with the venue and access, but last week’s Business Travel Show (BTS) and accompanying Travel Technology Europe (TTE) were record breaking and easily the best since the first of the series at far-away Islington in 1994. The Overground does now connect well to most places but why TfL only runs the Tube to Olympia at the weekend is beyond BTN’s understanding. BTS serves as a great networking opportunity, a sales pitch for participants, and the opportunity to learn and discover at a large conference programme over the two days divided into 'Manage Your Travellers', 'Travel Management', 'Suppliers and Service Providers and Technology and Data'. There was little doubt that software was the king this year and perhaps difficult for some companies to decide whether the ground floor, BTS, or the balcony, TTE, was for them. Amadeus took a high profile spot in the main hall, whilst Sabre, for the second year running, booked a large space upstairs and included a lecture theatre, always packed out for a series of talks. Some airlines choose to have significant presence, American, Saudia and in particular Etihad with a huge trailer incorporating its Residence Suite and what you might call ‘normal’ First Class. Magnificent and due on a UK sales tour shortly. Also clearly pleased with the results from 2015 was easyJet with a large stand and Aer Lingus showed the flag for IAG. London City Airport showed its refurbished Western Pier, ready autumn 2016. The major infrastructure extension is currently held up by the Mayor of London, but only temporarily we are told. The airport is now fully cleared for more flights and ready to welcome both the new Bombardier CSeries and Sukhoi SSJ100 later this year. 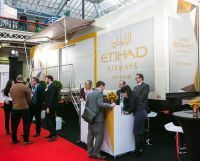 Lounge Buddy, which calls itself an access wizard, made a first time offering at the show, and with a strong presence was Priority Pass, the membership programme with access to 850 lounges worldwide. A new app tells you just where the Priority Pass facility is either before you arrive at an airport, or when actually airside. Plaza Premium, the Hong Kong based lounge operator, is now firmly established at Heathrow with facilities available in both T2 and T4 with plans for much needed landside operations at both terminals. Egencia announced the results of its second annual Global Business and Travel Technology Survey and AirPortr, the same day airport luggage delivery service, confirmed it is adding Heathrow T4 on 14 March to its established operation at T2, T3 & T5. It is also at Gatwick and London City. 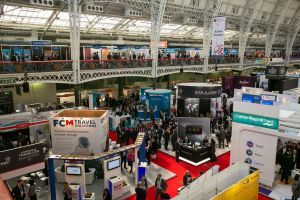 The British arm of the Diners Club franchise was at the show with the latest version of its virtual cards offering bespoke management information, reconciliation, spending authorisation and fraud protection all guaranteed before a payment is even made. Carlson Wagonlit Travel (CWT) has been a long-time supporter of BTS and these days focuses on innovative technology. A central payment solution is essential. With operations in 150 countries and territories, any solution CWT offered had to work seamlessly with multiple card schemes and card issuers around the world. The solution, as demonstrated at the show, was supplied by Conferma using VCN (Virtual Card Numbers) compliant with international security standards. “The VCN has become a major topic of conversation across the industry and with a number of our clients, not least because it solves many central payment problems, including some they didn’t even know they had. VCNs make reconciliation easy and take away the problem of travellers using their personal credit cards. And at a time when businesses are becoming more and more aware of fraud, the VCN can cut exposure to payment and employee fraud, and keep data breaches to a minimum. “The adoption of Conferma’s VCN solution is enabling us to offer an online, central payment solution for hotels and low-cost carriers. Before the VCN, bookings used legacy processes when central payment was required, which would often only be available offline. “As we continue the process of rolling out VCNs, there is potential for further growth in the content we can support, such as all airline booking and car hire.